Pegasus Voyages provides crewed, sailing charters on San Francisco Bay aboard Pegasus, a beautiful, classic 51-foot wooden ketch. We offer a variety of charter voyages that can take you, your family, and friends on an unforgettable tour of the Bay. Pegasus Voyages, a non-profit organization, uses all proceeds from its charters to help fund the Pegasus Project, which takes volunteers and youth sailing on the Bay aboard Pegasus. Short of time? We will get you out and back in 3 hours flat. 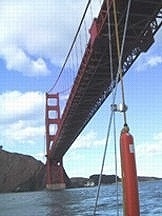 Want to look up at the Golden Gate from a boat instead of down from a speeding car? No problem. Check out all three bridges in the North Bay? Can do. Getting married? We can tie your knot. Crossing over the bar? We can take your remains and your loved ones there. Need situational awareness? Try Zen sailing. 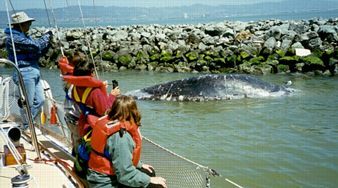 Want to learn about marine wildlife in the East Bay? Welcome aboard. We will work with you to show you the Bay and the boat in the time you have, at an affordable price. 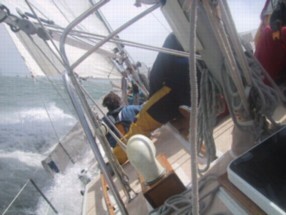 All charters are crewed by Pegasus skipper and/or crew person. To reserve your charter, go here. To contact us, call Peter Hayes at (510) 717-4439, or use our contact form. Three-hours cruises are 9 a.m.-noon or 1-4 p.m. Four-hour cruises are 9 a.m.-1 p.m. or 1-5 p.m. Eight-hour cruises are 9 a.m.-5 p.m. Ten-hour cruises are 8 a.m.-6 p.m. "By special arrangement" means start and end times are customized. Prices are for weekdays (shown first) and weekend or holiday dates (shown second). From the Berkeley Marina, we head out to the end of Berkeley Pier and northwest toward Angel Island; if the tides and wind permit, around Southampton Shoal and back to K-dock. Morning is calmer and warmer. Afternoon in summer is an intense introduction to the East Bay. With an extra hour, we can get either to Point Blunt of Angel Island across the shipping channel or into the east end of Racoon Straits, and back to Berkeley. 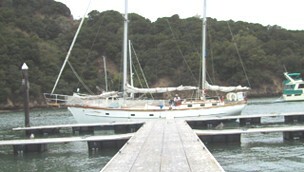 Or, we can heave to for lunch in the lee of Angel Island, and head home with the wind behind us. Around Angel Island, Treasure/Yerba Buena Island, or Alcatraz Island. We won't be stopping on shore, but you will see an island from all angles, like Juan de Ayala, the first Spanish explorer to enter and map the bay in 1775 in his ship, the San Carlos. We offer the only direct access to Angel Island from the East Bay. 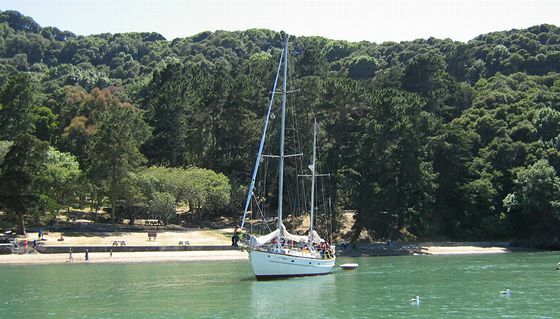 We will tie up at Ayala Cove on the north coast of Angel Island (availability of dock permitting), allowing you to roam the island, see the Museum, grab a cappuccino, ride a bike, tram around the island. After boarding, we head west up Racoon Straits and along the west coast of Angel Island to the SF foreshore before broad reaching back to Berkeley. This is the big one: Depending on tide and wind, roughly 23 nautical miles of sailing. You will see ships, seals, bird life, and the ultimate experience, the Golden Gate from below, as you pass under it going out to sea, and then again, coming back under as you head for the San Francisco shoreline, past Alcatraz and Treasure Islands, and back to Berkeley. Some people just want it all. This voyage takes you under all three bridges of the North Bay — first the Richmond-San Rafael bridge, then via Racoon Straits the Golden Gate, then via the San Francisco shoreline the Bay Bridge, then back to Berkeley across the Emeryville Flats. Captains Rosie Kuhn and Paul Kassatkin remind us that, like the gentle tug of the tides, the ocean draws us back to our spiritual selves. By learning to sense the rhythm of the sea, to feel the motion of the vessel, and to listen to our inner voice, we will use gentle and simple exercises to help you find your "inner sailor." What better place to tie the knot than at sea? We will heave to while a marriage celebrant ties your knot. At the end of your wedding voyage, you will each receive a gift Nantucket turkshead rope bracelet. We will take you to Kirby Cove just outside the Golden Gate, where the powerful tidal currents will carry your loved one's ashes swiftly out to sea. The East Bay is full of wildlife — above, on, and below the water. 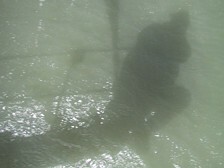 We will show you current boundaries: floating ecosystems that move around the bay with the currents. We will show you birds, marine mammals, and whatever else pops up. We will also help you visualize the Bay before humans rebuilt it. With some notice, we can design a voyage for you. We can pick you up at a remote location or vary the arrival and departure hours. We can even do overnight voyages. Contact us and we will help you design your voyage on the Bay.